I made a video with my phone… so can you! Your video should be less than 1 minute long. Success in public speaking takes practice. Many people avoid practicing because they have fear or anxiety about public speaking. Making videos is a great way to practice without having to bring together a live audience! Talking about your own knowledge and experience can help you develop more accurate self-assessments. If you aware of and understand your own strengths and weaknesses, you will be able to plan and prepare your speeches more effectively. In class, you wrote about your experiences with public speaking and your ideas about how to be successful as a speaker. Think about what you wrote in class, and about what other students said in discussion. Using these ideas, write a few notes for yourself. You should try to focus on only a few key ideas or examples. 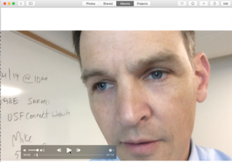 Use your phone or computer to record a short video introducing yourself to the class. Be sure to include key information (most importantly, your name and what you would like people to call you). Make several different versions and choose the one you like best. Remember, your video should be less than 60 seconds long. Short video, less than 60 seconds. Introduce yourself to the class—be sure to include your name. Tell a little about yourself as a public speaker: what are your experiences, your strengths, your challenges? Bring the video (on your phone or computer) to class on Thursday, January 26 — or, if you are able to get your blog up and running, post it there. Northeastern University professor Jim Papadopoulos wrote the book on bicycle dynamics. Decades into his career, he’s still tinkering away—and his five latest projects could shake up your bike life for the better.